The work breakdown structure (WBS) is the best way to communicate a project’s scope with stakeholders. 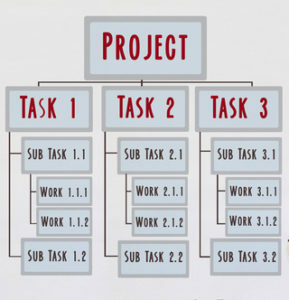 It paints a clear picture of the in-scope work for the project in a hierarchical format so everyone can see the work elements in relation to one another. It’s a core artifact that all project managers should maintain and exploit on a regular basis. So, why do so many PMs fail to take advantage of this powerful tool? One of the key reasons is lack of access to WBS-specific applications. In smaller organizations, cost can be a factor–the entry point for WBS Schedule Pro, for example, is US $349. Mind you, that’s for four licenses; and, relative to other desktop applications, it’s not that expensive. Then, there are also low-cost/no-cost alternatives, such as WBS Tool. Beyond cost, however, there is the overhead of introducing new software into a locked-down environment. Getting permission to install a new application or getting approval to access/store data from an on-line application can be a small project in itself. After being asked, “What’s a work breakdown structure?” and “Why don’t you just use Excel?” for the umpteenth time, many PMs just cut their losses and throw in the towel because the effort versus gain become questionable. What about MS Visio? Many desktops have it installed; and doesn’t it specialize in drawing boxes with text in them? Sure it does. 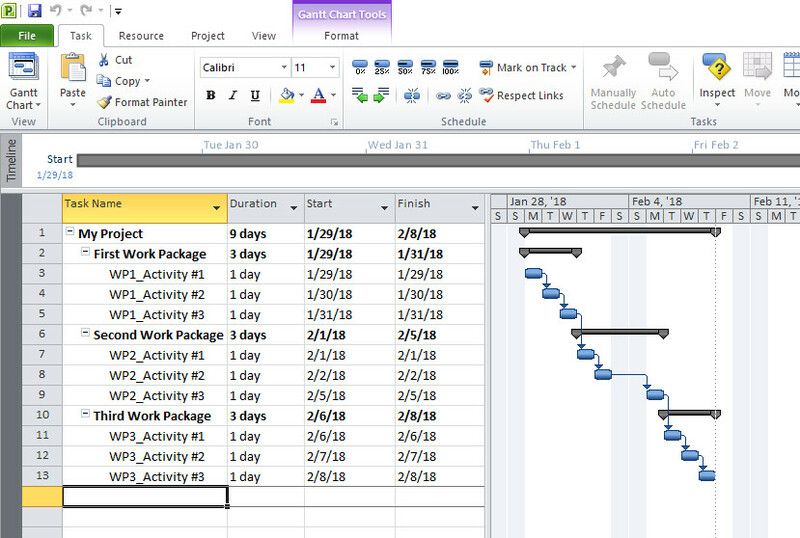 However, given the number of work items in a typical WBS, it’s sometimes hard to justify the futzing-around time investment required to create and maintain a WBS in Visio. If only there were some magic that would automatically arrange all the boxes and lines for us. When you think about it, a WBS is not unlike an organization chart–they are both hierarchically-arranged boxes with text in them. The only difference is, an organization chart contains names and business titles whereas the WBS contains work packages, tasks and activities. 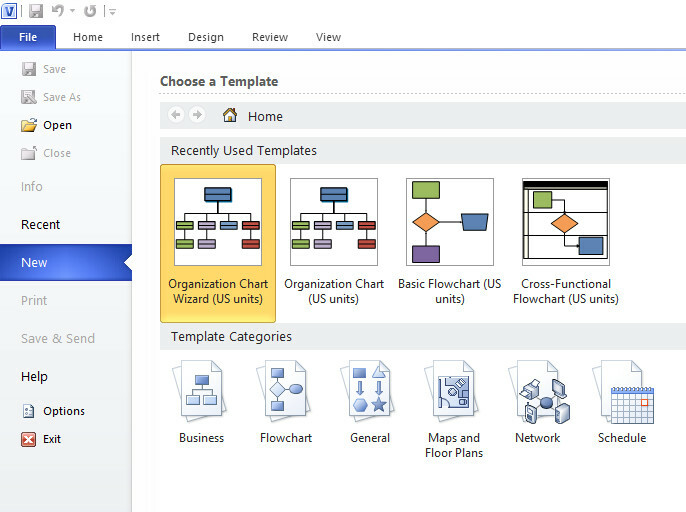 Luckily, creating organization charts is something Visio does well; and we can capitalize on this. 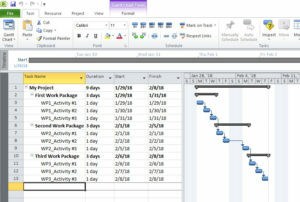 The magic lies in Visio’s Organization Chart Wizard that uses an Excel file with two column headings–“Name” and “Reports_to”–to create organization charts: Create an Excel worksheet with names under these columns, and Visio creates an org chart for you. 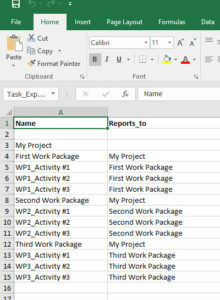 To create a WBS, simply copy and paste the Tasks from an MS Project file under the “Name” column. Then copy the work elements that each rolls up to and paste them under the “Reports_to” column. 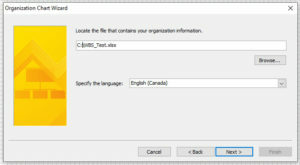 Save and close the Excel worksheet; and you have a WBS source file for Visio’s organization chart wizard. Open Visio, run the wizard, and Bob’s-my-uncle (no kidding–he really is), you have a WBS. 1. 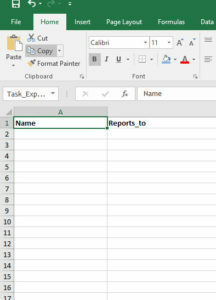 Create and save a new MS Excel worksheet with headings called “Name” and “Reports_to” in the first two columns. 2. 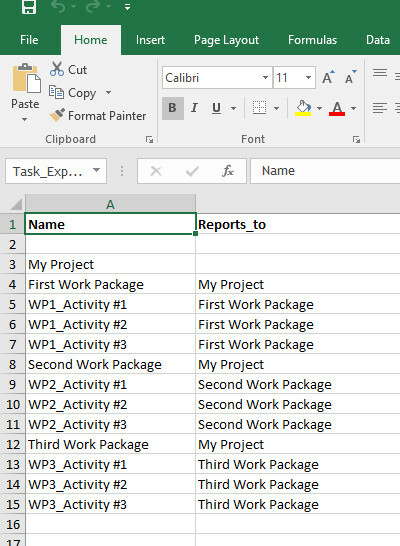 Open your MS Project file, and select/copy the tasks you wish to have in your WBS. 3. 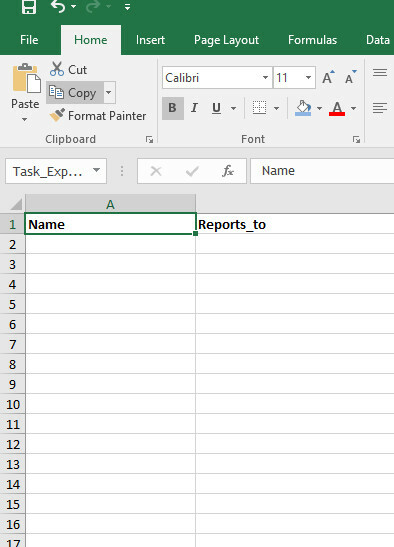 Paste the copied tasks under the “Name” heading in the Excel worksheet. 4. 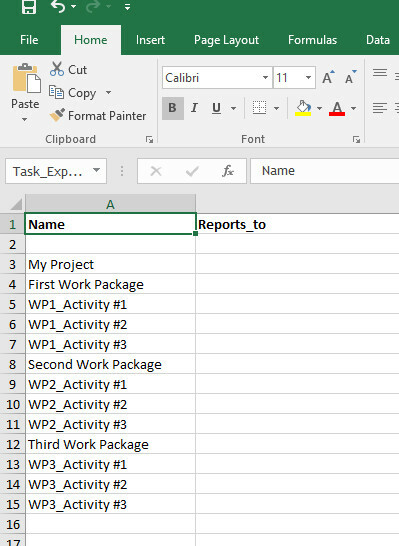 Copy higher-level items, and paste them in the “Reports_to” column beside the work elements that roll up to them. 5. Save and close the Excel worksheet (Note: The Excel file must be closed for the Visio wizard to work). 6. 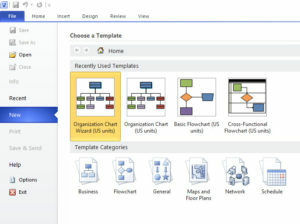 Open Visio, and create a new diagram using the Organization Chart Wizard selecting the default options, entering the path/name of the Excel worksheet you created. OK, so there is one small hitch. If you look carefully at the last image, you’ll note some of the work elements are not in order. The wizard does not always place the work elements in that are on the same level the same order as they were in the the Excel worksheet. While, technically, this is acceptable because WBSs do not need to reflect precedence, to put things in order a bit of clean-up is required. The world is not quite perfect. We hope this tip will help you better communicate scope by using a WBS. Got a question regarding project management best practices? Contact us–project management is something we do well, and we’d be happy to help. To find out more about our project and program management services, please visit us at Professional Services Plus.